Erlocip (Erlotinib) by Cipla is generic version of Tarceva (Erlotinib). 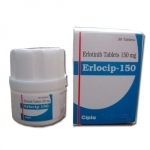 Erlocip (Erlotinib hydrochloride) (originally coded as OSI-774) is a drug used to treat non-small cell lung cancer, pancreatic cancer and several other types of cancer. It is marketed in the United States by Genetech and OSI Pharmaceuticals and elsewhere by Roche under the tradename Tarceva. Similar to Geftinat (gefitinib), Erlocip (Erlotinib) specifically targets theepidermal growth factor receptor (EGFR) tyrosine kinase, which is highly expressed and occasionallymutated in various forms of cancer. It binds in a reversible fashion to the adenosine triphosphate(ATP) binding site of the receptor. For the signal to be transmitted, two members of the EGFR family need to come together to form a homodimer. These then use the molecule of ATP to autophosphorylate each other, which causes a conformational changein their intracellular structure, exposing a further binding site for binding proteins that cause a signal cascade to the nucleus. By inhibiting the ATP, autophosphorylation is not possible and the signal is stopped. Erlocip (Erlotinib) has shown a survival benefit in the treatment of lung cancer in phase III trials. It has been approved for the treatment of locally advanced or metastatic non-small cell lung cancer that has failed at least one prior chemotherapy regimen. In November 2005, the U.S. Food and Drug Administration (FDA) approved the use of Erlocip (Erlotinib) in combination with gemcitabine for treatment of locally advanced, unresectable, or metastaticpancreatic cancer. A test for the EGFR mutation in cancer patients has been developed by Genzyme. This may predict who will respond to Erlocip (Erlotinib) and other tyrosine kinase inhibitors. It is reported that responses among patients with lung cancer are seen most often in females who were never smokers, particularly Asian women and those with adenocarcinoma cell type. Erlocip (Erlotinib) has recently been shown to be a potent inhibitor of JAK2V617F activity. JAK2V617F is a mutant of tyrosine kinase JAK2, is found in most patients with polycythemia vera (PV) and a substantial proportion of patients with idiopathic myelofibrosis or essential thrombocythemia. The study suggests that Erlocip (Erlotinib) may be used for treatment of JAK2V617F-positive PV and other myeloproliferative disorders. The drug's US patent will expire in 2020. . In India, generic pharmaceutical firm Cipla is battling with Roche against the Indian patent for this drug. In April 2009, the Delhi High Court granted a final approval to Cipla to manufacture and sell its generic version of Erlocip (Erlotinib) in India. Meanwhile, another generic pharmaceutical firm - Natco is also seeking to manufacture the generic version of Erlocip (Erlotinib) in India BUT sell it to patients in Nepal using the TRIPS Agreements' Doha Declaration. It has also been suggested that Erlocip (Erlotinib) can cause hearing loss. 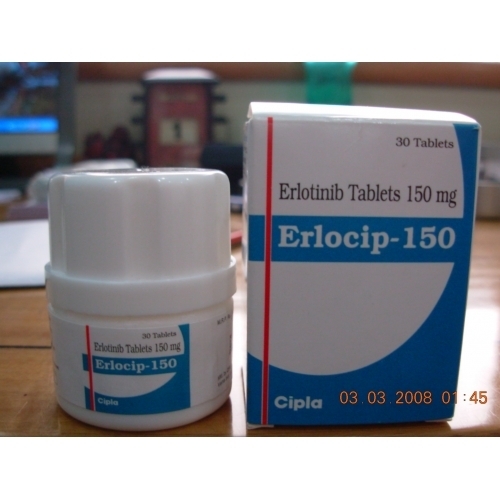 In spring, 2009, the US Food and Drug Administration issued a warning on the cancer drug Erlocip (Erlotinib). The FDA reported serious gastrointestinal tract, skin, and ocular disorders in patients taking the drug. In addition, according to a letter released by Genentech and OSI Pharmaceuticals, some people prescribed Erlocip (Erlotinib) have developed serious or fatal gastrointestinal tract perforations; "bullous, blistering, and exfoliative skin conditions, some fatal; and serious eye problems such as corneal lesions. Some of the cases, including ones which resulted in death, were suggestive ofStevens-Johnson syndrome/toxic epidermal necrolysis. For more details please download the following PDF erlocip product brochure.